A tidal wave of great new covers from indiefolk to freak to alt-country has slammed through my mailbox in the past week or two, jamming my aural pleasure circuits and tipping over onto the page. Our usual three-artist once-a-month model is so unprepared to handle the onslaught, I thought I’d try something a little different. But not today. Not yet. Because before we get to the music, I have a serious matter of grave importance to discuss. See, it’s easy to put a positive spin on things. But while it’s true that there’s more than enough great material stacked up for a full week of new and stellar coverfolk, it’s also true that — as I alluded to earlier this week — music blogging has suddenly become a much less comfortable pursuit for many of us. The blogs you love are under siege. Threats and legal repercussions fell like bombs last week. The clock is ticking on my current file host, and the blogosphere is overrun with fellow music bloggers who have been hit with take-down notices, and –more significantly — had file and blog host services pull files and posts with no previous notice. Many of these notices, like my own recent suffering, are perfectly spurious. In my case, a little digging has turned up the sad and frustrating fact that I lost a post to blogger, and subsequently am losing my file host, for sharing Joe Crookston’s live cover of The Logical Song, a file which — are you ready for this? — was recorded by yours truly, live in concert, and was posted with written permission from the artist, who in turn has already paid his due to Supertramp’s copyright holder for use of that particular song on his recent album. This is, of course, perfectly legit filesharing, all bases covered, fully legal under current US copyright law. As was Chad‘s use of a live Elliot Smith song from a public domain source, posted in loving tribute to a great blogger’s greatest influence. As was Ed‘s use of already-posted demo recordings given him by the band, and the early interview which he lost along with it. But regardless of legality, the result is a heightened atmosphere of concern in the blogosphere. The stress and strain of such struggle with hosts and overzealous industry representatives desperate to reclaim their dominance, not to mention our inability to reinstate those files immediately under the terms of recent US legislation (see previous post), is taking a severe toll. We’ve been hit where we love, we’re pretty small next to the might of a label wielding the dangerously unbalanced weaponry of the Digital Millenium Copyright Act, we depend on file hosting from organizations with terms of service contracts that include the phrase “we reserve the right to terminate for any reason, at any time”, and we’ve got families to worry about. The deck is stacked high against us, and without a union or bottomless pockets, many are seriously considering throwing in the towel. Heck, some bloggers are throwing in the towel already. Me, I’ve got two weeks to find a new file host, and none of the options out there are looking perfect. While we decide what all of this this means for us here at Cover Lay Down, we’re using the opportunity to clear the decks of any and all label-approved new releases as part of our mid-autumn new artist spectacular. Happily, it’s a rich pot: this fall and early winter will see a huge amount of wonderful folk releases from the full range of the genre spectrum, and the covers which are appearing on those albums are startlingly good. I’m in no position to plan for a long-term future right now, though I’m not yet ready to call it the end. But if we have to go down, this is the way to do it: head held high, music blaring, artists celebrating their influences, the strings delicate and low, fading into nothingness. Enjoy the week, folks. Here’s hoping it’s not our last. I’ve seen a few other blogs get to Graham Lindsey already, but it bears repeating: his newest package of CDs is a stunning set. The album We Are All Alone In This Together and its accompanying EP The Mine are a perfect mix of the rootsy, strained-voiced neo-old timey music recently made popular by such indie phenoma as the Avett Brothers, true string band music of the new resurgence movement, and southern countryfolk singer-songwriter fare a la Slaid Cleaves. Deep, dark, and raw, this is true-blue Americana Primitive music, prototypical and perfect; music which belongs on the shelf next to Gillian Welch, and can hold its own against it, too. It’s incredible stuff, and I haven’t been able to listen to anything else since I first put it on. There’s only one cover on The Mine, but it’s a doozy, a mournful acoustic-primitive take on Hank Williams downer The Angel of Death. The song is a bit slower and sparser than the remainder of the songs in Lindsey’s one and a half disk set, but it’s a great part of the success of The Mine as a perfect postscript to the larger album. Graham’s promoter has given me permission to do “anything I want” with this lovely, powerful Hank Williams cover, and I’m really grateful for the opportunity to share it with you. We Are All Alone and The Mine drop together on November 18; you can get the EP free if you preorder before then via the paypal link on Graham Lindsey’s MySpace page, and that’s certainly the option we recommend. 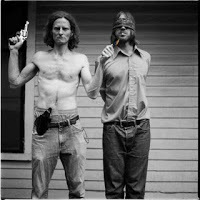 Peace Queer, the new work from old anti-establishment rocker Todd Snider, has been making the blog rounds, too; it’s not folk, per se, preferring instead to cover a wide range of grungerock and garagepop, but it has some lighter moments, and none so precious to the coverfolk fan as this haunted, whispery acoustic Creedence Clearwater Revival cover. I previously shared this cover over at Star Maker Machine, along with a few other covers of Fortunate Son, but I’ve been encouraged by readers to drop it here as well, and I’m happy to oblige. The harmonica cry is a basic training train’s mournful wail, and Patty Griffin’s harmonies are a perfect echoing addition to a sparse setting; the overall effect is a song which turns an angry cry into something plaintive and reflective without sacrificing one whit of its political potency. Thanks to its fully social-media-minded artist, Peace Queer remains free for download until October 31, at which time it will presumably turn into a pumpkin, and this track’s legitimacy will shift a bit. For now, at least, its give-away status makes it perfectly legal to share here, as well. The Peptides present as a small-scale Quebecois musical theater troupe with somewhat poppy tendencies, heavy on the vocal harmonies and indie moxie, more earnest than Rufus Wainwright, not so much folk as borderline torchsong experimentalists with a background in a capella music and a few keyboards sitting around the house, just in case. But as the first-person writing on “their” website demonstrates, The Peptides is really a project built around visual artist and singer-songwriter Claude Marquis with the help of his occasional vocal partner Pam. 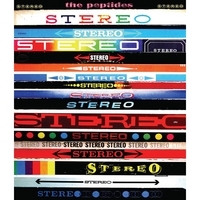 And as the demos and othertunes on their website, including a few choice covers and outtakes from new album Stereo Stereo show, there’s more to this band than just a schtick and a lipstick kiss. With a tendency towards approaching coversong as an opportunity to turn pop hits into melancholic slowtunes, The Peptides can come off tacky in demo form, but I think the tone is deliberate; anyone who covers so many ‘Til Tuesday songs, and refers to his own tiny take on David Bowie’s Sound and Vision as “beatless and on laxatives” knows exactly what we are hearing in him, and revels in its kitsch. While the former is more novelty than gem, however, their cover of Lennon classic Jealous Guy is a perfect slow winter thaw of a song, while these two takes on 80s radiopop hits offered here are great: a delicately lush retropop plucked-string Mary’s Prayer and a wonderful jazzfolk a capella Major Tom, just a hair more polished and thought-through than those Petra Hayden Who covers that were making the rounds last year. Better, they come direct from a band who “would be honored to have our covers that appear on STEREO STEREO posted on your ‘Cover Lay Down’ blog.” I’m honored to share them with you in turn. Cover Lay Down will return Wednesday with news and label-sanctioned covertune downloads from some great up-and-coming young female singer-songwriters. We are also eagerly awaiting one final covertrack from the Denison Witmer Covers Project. From there, the future remains uncertain.